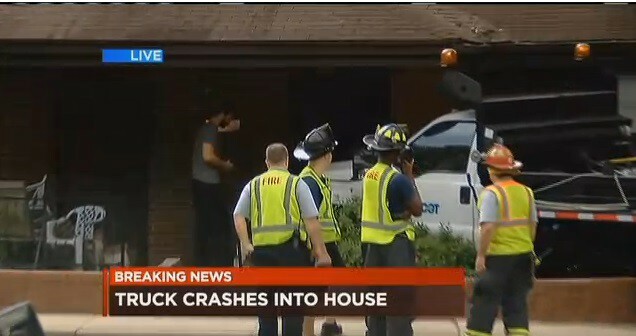 DOT Truck Smashes into House: Surprised? On my way home from work last night, I passed by the site of a home adjacent to a 5 lane road in Columbia, that just had a work truck plow through its front door. The truck entered the front room of a house. This isn’t entirely news in Columbia. Two years ago, another truck did the same to a house 1 mile away from this one, though across from MY house. And there was a third a few years before that, at the same intersection. I rub my eyes perplexed at the thought that this could one day, or might already be, one type of “normal” in this town I call home, where my husband and I choose to raise our 18 month old daughter. A truck plows into a house. Ah, no big deal. Happens all the time. But this time, it’s an SCDOT work truck. Actually, the street where the truck entered this guy’s living room yesterday – was designed for the crash. Here’s how: SCDOT widened this 2 lane road in 1969 to 5 lanes. They put the outer lanes within 15 feet of the front doors of every house on both sides of Rosewood Drive. Each lane is 12 feet wide with a 14 foot two-way-turn-lane in the middle. Without burden, cars travel over 40mph easily. SCDOT projected 18,000 cars a day would be at the site of the latest wreck by 1991, and the number now is about 20,000. Federal safety guidance has changed since 1969, and they now recommend reducing the numbers of lanes to 3 on streets with this same amount of traffic. Why? Because it is safer. And it easily makes room for bike lanes. Another boon for safety. It is 2016, and City of Columbia did a Bicycle and Pedestrian Plan that recommended Rosewood be reduced to 3 lanes, making room for bike infrastructure. SCDOT has said no. The one pedestrian refuge island on the entire street (it spans a few miles) was placed mid-block leading to the school’s entrance, but there are no other refuge islands on the street. At this intersection is where the work truck ran a red light. Most intersections are pushed out as wide as possible, so cars can speed around corners, though perhaps SCDOT knew this intersection needed special consideration because here the intersection radius is smaller and therefore safer, and right-on-red is restricted. Yet still no refuge island. With one mid-block island, no bike lanes, no sidewalk buffers, and few adequately painted crosswalks on the entire street (there are a few in front of the school), it is almost understandable why cars think they have the right of way versus pedestrians and bicyclists. The street almost tells them that, yet the law doesn’t say that, exactly. SCDOT needs to do so much more on the entire street. To the north and south of Rosewood Drive are land uses almost entirely residential, though small local businesses line the actual edges of Rosewood Drive. And that is why we live here. Except for the fast cars. Your environment influences your behavior in ways traffic cops burdened with traffic enforcement – don’t have enough hours in the day to convince you otherwise. My daughter will go to Rosewood Elementary school in 4 years. Three cars hit 3 houses in about the same number of years, within a mile of each other. Please don’t let this be a “normal” of where I live. I ride and walk my neighborhood all the time. I moved here because all types of folks walk the sidewalk in front of my house, from all ethnic backgrounds, and many to and from the community park one block from my house. This high diversity adds a huge value in my mind to my property and home and it comforts me. I grew up around others like this, and in my lifetime went to and taught at schools with people of this same diversity in race and income. It is normal to me. The fine arts Magnet School I attended for 7 years had a quota to reflect the same racial makeup of its surrounding county. This experience was just one of a lifetime of many that motivate me to discuss race openly, transparently, truthfully and with no fear. I chose this home as my first home purchase for my family, because it feels like home. I was also taught to value this. I’m bothered by one race walking on the margins of roads, in conditions noticeably less safe – than those more often of a lighter complexion traveling down the middle of streets in the comfort of 2 tons of steel protection. Very expensive steel protection. We are taught to think of our streets as public, yet they are not. Increasingly, they are not. Our public spaces are being privatized. Racial diversity feels normal to me. Trucks or cars plowing into homes? That is not normal to me. Our state has an unofficial policy that it will not fund pedestrian and bicycle accommodations on state owned roads. It recommends them, but puts virtually no money towards them, relative to what it invests in space reserved for automobile traffic. Understood is that pedestrian and bike accommodations are a local expense – yet still subject to state highway design. State highway or street design remains persistently arcane and is documented as more dangerous to the safety of people on foot and bikes, than the modern urban design manuals. This all occurs regardless of repeated attempts to improve that design, by the Palmetto Cycling Coalition and other local affiliated organizations – all working to improve the safety of all vulnerable road users, pedestrians and bicyclists, people on foot, bike, or on the way to a transit stop. Rosewood Drive is a state owned road, with high crash rates for people on foot and bicycle. The Rosewood neighborhood to the south of Rosewood Drive is a very diverse area. The truck that entered the guy’s house on Rosewood Drive was an SCDOT work truck that didn’t see the light. Because the road was designed for speed, not people. I won’t move away from this great neighborhood. Instead, I’ll make efforts to improve it.